Cable remains at the back foot in early American trading on Monday and probes below pivotal 1.29 support zone, after weak UK data further soured the sentiment. 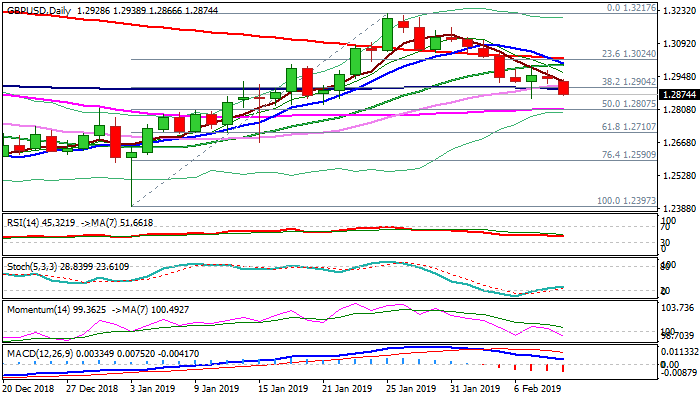 Sterling entered the third week deeply in red, pressured by Brexit concerns and stronger dollar, with downbeat UK GDP data today, adding to bearish sentiment. Data showed that Britain’s economy slowed significantly in the last quarter of 2018, mainly due to Brexit fears. Q4 GDP showed that quarterly rate of growth slowed to 0.2% vs Q# growth of 0.6% and also undershooting 0.3% forecast. Other data released today, also showed negative figures (IP Dec -0.5% vs 0.1% f/c and Manufacturing Production Dec -0.7% vs 0.2% f/c). The data showed strong concerns about disorderly Brexit after UK PM May’s divorce plan agree with EU was voted down in parliament, less than two months before the UK’s final exit. Further weakness could be anticipated on firm break below 1.29 handle that would offer fresh negative signal and accelerate bears for test of Fibo 50%/55SMA supports at 1.2809/07 and daily cloud top at 1.2786.